Plans for opencast mining near Neath have been refused - almost six years after the idea was put forward. 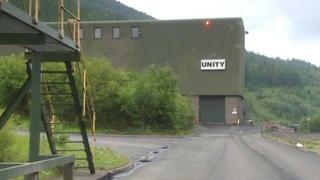 The Unity drift mine, in Bryncwm, went bust in 2013 with the loss of 181 jobs, while Neath Port Talbot Council was awaiting more details about its proposal to start opencast operations. Administrators are still hoping to sell it and another opencast mine. Planning officers said Welsh Government energy policy now allowed mining only in "wholly exceptional circumstances". Before it closed, Unity was Wales' largest drift mine, one that miners can walk into rather than take a lift down to the coalface. Its owners Horizon Mining had warned staff that the work was running out. The firm was awaiting a decision on an application made in May 2013 to start opencast mining at the site when it went bust in October. A report to Neath Port Talbot's planning committee on Tuesday said the administrators Cork Gully were reluctant to spend the money needed to provide the extra information requested by the council about the proposal. Planning officers said the administrators were now looking to sell the site and its opencast proposal as a package with another opencast site at Bwlch Ffos, according to the Local Democracy Reporting Service. However, councillors were told Aberthaw Power Station - the intended destination of the coal - no longer accepted Welsh anthracite coal, and administrators had not suggested alternative markets. Planning officer Steve Ball said it was "not usual" to have applications still open for so long. "This one has been hanging around because there was a requirement five-plus years ago for additional information to enable us to properly assess the impact on the environment," he said. Officers said there were no exceptional circumstances to permit a new opencast mine, and councillors voted unanimously to refuse it.